The craftsmen of Gaia are truly imaginative in the combinations of stone they use in their wall projects. This wall uses Molalla, Idaho Mt and Willamette Valley granite with some rose sandstone accents for a spectacular effect. 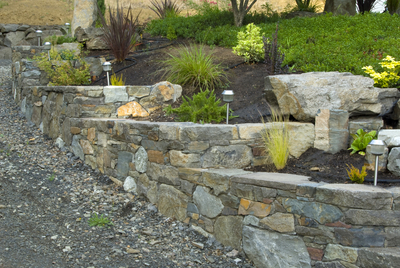 These terraces were drystacked using a blend of 6", 8" & Drystack Ledgestone with large boulders extruding throughout the landscape to make this wall look like it has been there a long time. Another view of a stairway on the Swanson-Allen project. 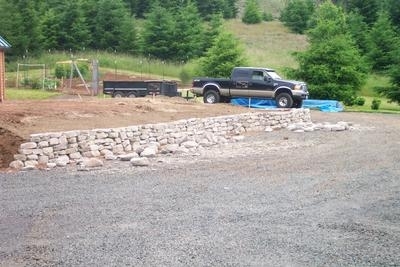 This wall and rockscape using Molalla stone by Gaia is truly amazing! This column rises 2 1/2 stories high and illustates the utility of this stone with it's high percentage of "corners". This is a mix of 6" and Castle Ledgestone. Anteek Ledgestone is used in this fireplace with a single piece mantle. The quarry produces a small quantity of this unique & rustic ledgestone. 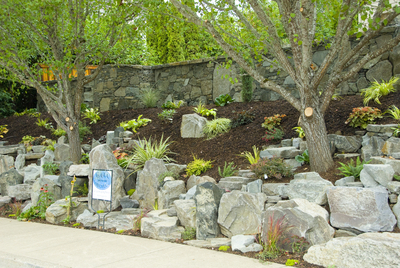 Built by Camas Landscape, this wall is built with an economical grade of Columbia Wall Rock that looks lousy in a pile but can end up as a beautiful wall with a little time and patience! Another photo of the Warren Residence - Mike Jones Masonry - nice job Curtis! The Warren residence is a showcase of this stone beautifully applied by Mike Jones Masonry.